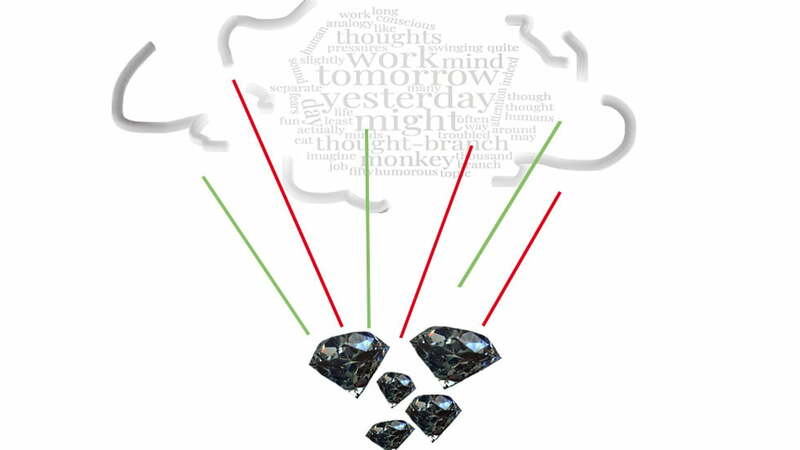 Research done in Stanford University (CA) indicates that compulsive thinking can be easily dissolved by rhythmic speaking over a long period of time. This was found while testing monks reciting sutras; but also our own research, conducted over more than 15 years, clearly indicates that the recitation of the TaKeTiNa syllables has the same effect. These syllables are a direct manifestation of sound and rhythm. They do not have any rational meaning and therefore the mind empties out, instead of filling up. Also, the voice gradually settles into an autonomous movement that makes it quite easy to recite those syllables over a long period of time. Once the monkey mind has calmed down, the next arena opens up. You see this represented by the green and red lines. Green stands for any positive thought, feeling or belief that arises as a reaction to a certain situation. It is our courage taking over and leading us to successfully solving a task, situation or problem. Red obviously stands for the opposite – inner voices such as „cannot do“, „way too hard“, „not again“, why always me?“ are weakening our power to act, just as flashbacks from previous negative experiences. In some traditions the two opposing forces are called „fear wolves“ for the red lines and „courage wolves“ for the green lines. And just as it would be in nature, the pack of wolves we give more food will be the one to stay with us more likely. It definitely is rewarding to work on strengthening the green lines and „to cultivate the courage wolves”. However, with TaKeTiNa we can go beyond the dichotomy of polarity altogether – beyond the green and red lines. TaKeTiNa facilitates this by physically and mentally connecting opposing states through rhythmic processes: participants learn to be active and passive at the same time while staying in a steady step, they learn to allow step movements to happen on their own accord while voluntarily creating contrasting rhythms with their hands and with their voice. The key element for this is the state of „simultaneous perception“ in which a participant of a TaKeTiNa process is able to process several different informations at the same time. While „multitasking“ generates stress by shifting the focus very fast between different tasks, the simultaneous perception is a door opener to an endless space in which everything can be absorbed and realised at the same time. It feels like that: the more you put into it, the emptier it gets. It is relaxation pure. 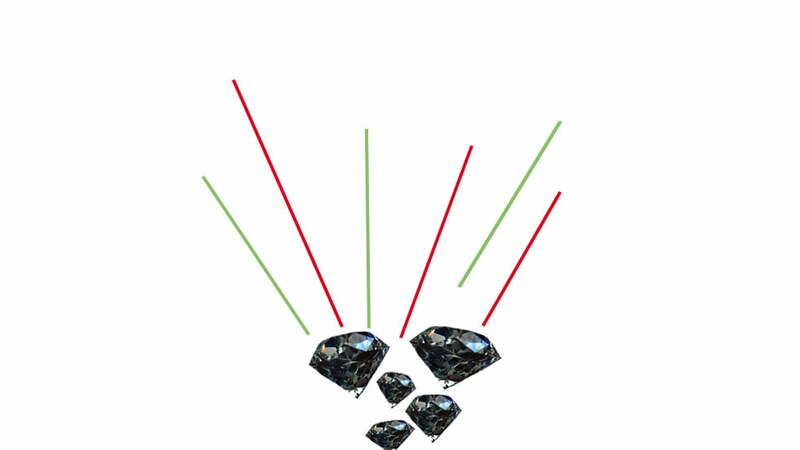 Whenever the TaKeTiNa process enables someone to temporarily go beyond the dichotomy of polarity, the green and red lines dissolve and make space for the diamonds to surface. 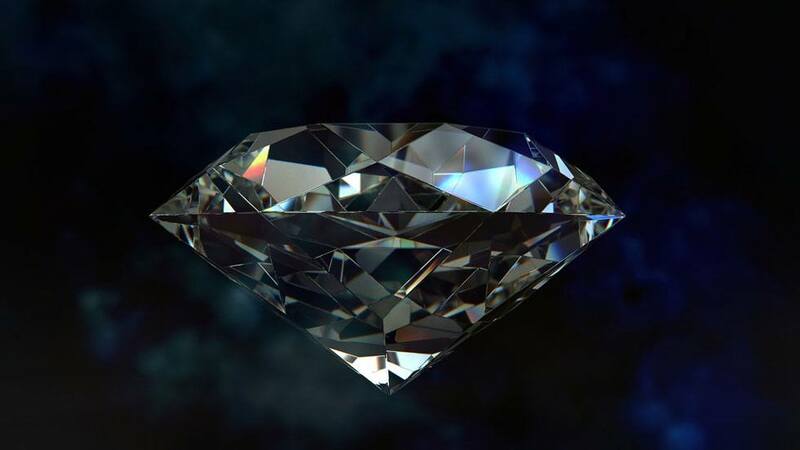 The diamonds are your essential creative nature. It is your primal rhythmic knowledge as well as the already existing solution to any problem that might be present in your life. They are your most fundamental resources. The inner most sense of the TaKeTiNa process is to enable people to access this realm of inner intelligence. You can experience this process directly by attending one of the two European TaKeTiNa workshops in spring 2018, coming up in Frankfurt and Munich. Both workshops, led by myself and co-led by Tania Bosak are focussed on the theme „Diamonds and beyond“. I hope that I could raise some curiosity for this unique way of self-mastery and I would love to meet you at one of the events.